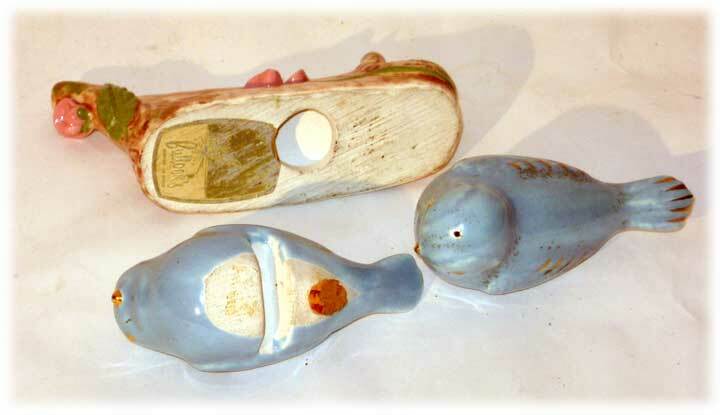 Birdie Salt and Pepper Shakers! Oh, Now, hey, people. This is kind of cute. Enough that I wouldn't mind keeping them if they didn't sell. Not that I would ever use them, because Mojo does not use salt nor pepper. I'm not a health freak or anything, I just got out of the habit when I was a kid (before then it was salt salt and more salt) and never looked back. I still LIKE salt, don't get me wrong (you'll need to check out the blog to review my feelings about pepper and how it nearly cost me my marriage), but while I enjoy salty chips and popcorn I almost never add it myself. Weird. What is it, you are wondering, while privately wishing Mojo would just shut up. 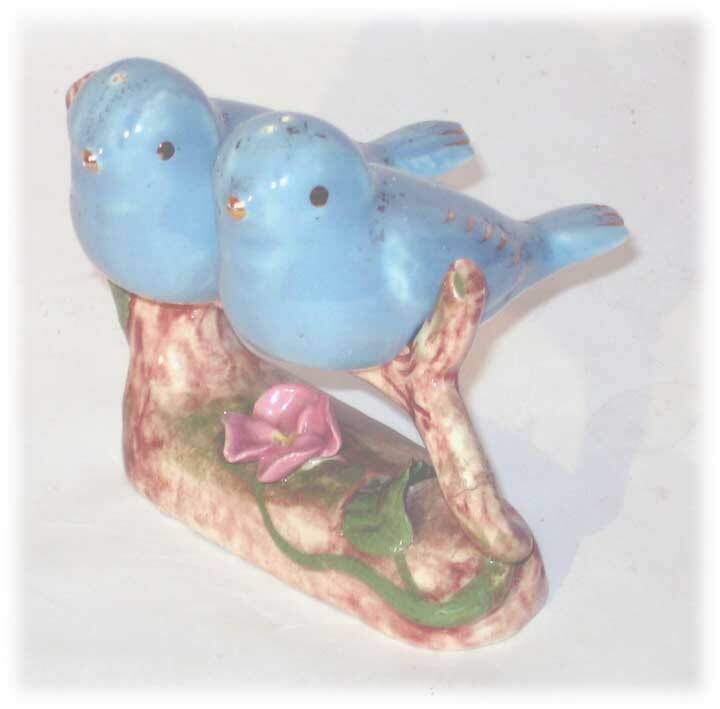 Apparently figural salt and pepper shakers of two little blue birds sitting on a fence. The birds have some sort of gold highlights, although I can't say if it's real or just some Rub 'n' Buff. (Do they still make that? Shows how much *I* know....) The birds sit on the fence via a slot punched cruelly through their bellies. Their nether regions are also corked up with what looks to be real cork to keep the salt and/or pepper from coming out. The holes are in their heads. They still have some salt and pepper in them, so clearly they have been used. 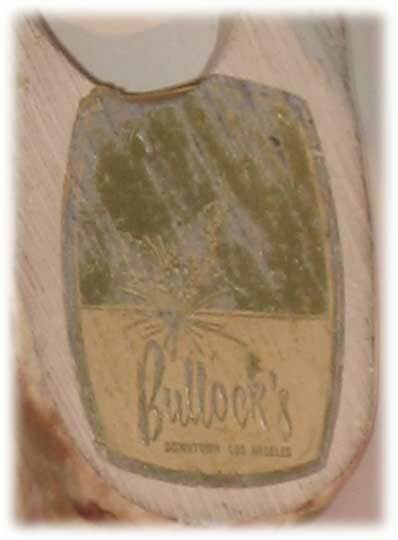 There is a sticker on the bottom of the fence that says "Bullocks" and below that, "Downtown Los Angeles". I have NO idea how old they are or who made them or anything like that. Your guess is probably better than mine. If you right-click on any of the pictures you might see more which may or may not tell you anything. This is the sort of thing where an expert will be getting annoyed with me at this point for not knowing what I am actually selling. To which I saw, maybe not, but it's a miracle I can tie my shoes in the morning, let alone recall all sorts of arcane knowledge about arcane topics. Ask me about movies. I like movies. But salt and pepper shakers are a little further down the list for me. Especially since, like I said, I don't actually USE the stuff. If you happen to USE salt and pepper like normal people and/or you like to collect salt and pepper shakers, this might be the item you've been waiting for your whole entire life. Or not. Even Mojo finds it mildly cute, which is usualy the kiss of death as far as popularity goes, so while this sentence sort of began as an endorsement as usual I have shot myself in the foot and have only muddied the waters further.